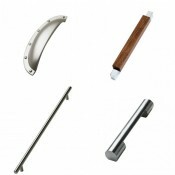 Kitchen Door Handles and Door Knobs. 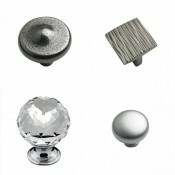 Cabinet Door Handles and Door Knobs. Wardrobe Door Handles and Door Knobs. 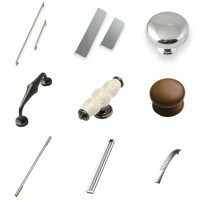 Bathroom Door Handles and Door Knobs. 14mm Bar Handle in Stainless Steel .. Round Bordeaux Knob in Cast Iron .. Bow Handle in Satin Chrome ..
Chunky Bow Handle in Stainless Steel ..
Creuset D Handle in Matt Black ..
Creuset Shell Cup Handle in Matt Black..
D Handle in Satin Nickel 126mm .. Forge D Handle in Pewter 144mm .. Round Forge Knob in Pewter 32mm .. Round Knob in Satin Nickel 32mm .. Shell Cup Handle in Satin Nickel .. 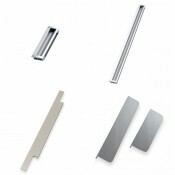 Slim Bar Handle in Stainless Steel 193mm ..
T Bar Handle in Heavy Solid Stainless Steel ..
Tapered Bow Handle Satin Chrome ..